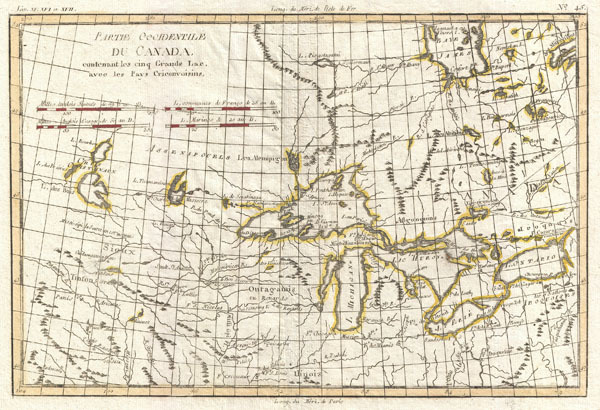 Important early map of the Great Lakes and upper Mississippi Valley. Partie Occidentale du Canada, contenant les cinq Grands Lac, avec les Pays Circonviosins. Bonne, R., Atlas de Toutes les Parties Connues du Globe Terrestre, 1780. Very good condition. Minor verso repair near the word 'Sioux'. Sellers, J. R. and Van Ee, P. M., Maps and Charts of North America and the West Indies 1750-1789, 173. Kershaw, K., Early Printed Maps of Canada, nos. 973-976.